Programming tools like annotations help you drive longer watch times. Today, you have another tool in your arsenal. Looking to promote your latest video? Trying the new feature called InVideo Programming. 1. Launch a new show/series: Launching a new series? Use “Feature a video” to showcase a new video to drive some initial traction. 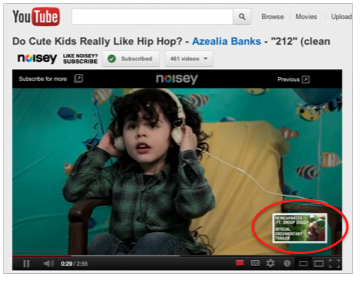 Example: Here you can see how Noisey used InVideo Programming to feature a new video across their entire library. 2. Showcase an old video: Have an older video that you want to promote? Go ahead and feature one of your favorite videos from your channel to drive some new viewership to that older video. 3. Reinforce channel branding: Make sure your viewers are aware of your channel branding. Use “Feature your channel” to promote your logo across your library and make it easier for viewers to visit your channel page and subscribe. viewers more context behind your promotion.